Cards on the table here. 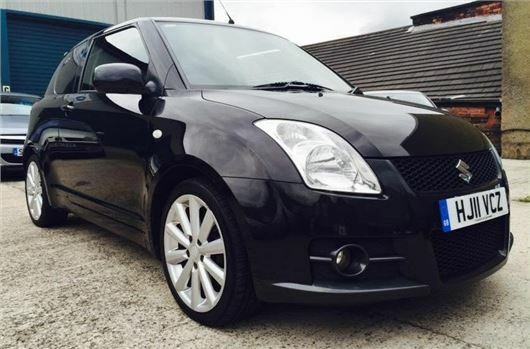 We've got a real soft spot for the Suzuki Swift Sport. In fact we've surprised ourselves that it has taken several week for it to make an appearance in Five Grand Friday. Which, for clarification, is definitely not a rip-off of A Grand Monday over on Honest John Classics. So why do we like the Swift Sport so much? Well it's all about the character. The Swift Sport harks back to a time when little sporty hatches were less about outright power and more about having fun. We admit that it's not especially quick with 125PS from its 1.6-litre engine - there are no turbochargers here - taking 8.9 seconds to get from 0-62mph. But that little buzzy 1.5-litre engine is an absolute gem. It's a car that you can enjoy driving without having to go excessively fast. Not that it's exactly slow. While those performance figures may not seem that impressive on paper, the Swift Sport will still nip along with brisk readiness and the VVT engine is always willing and happy to be revved to the red line. The other thing we like about the Swift is its understated nature. This is no hooligan hot hatch - it's the opposite of big brash wings and exhausts the size of drain pipes. It's far more subtle than that, although the sporty cues are there with twin exhausts at the back and a tailgate spoiler, a honeycomb grille along with 17-inch alloys. We're big fans of red paintwork on a Swift Sport but we couldn't look past this stylish black example we found in the classifieds. There are lots of Swifts on the used market with bonnet stripes and the like, but this more sombre model still has plenty of appeal. Not least because it has only covered 36,000 miles - slightly below average for a four-year-old car. It looks in good nick, aside from a very small dent on the bonnet (we had to squint to see it in the pictures), with gleaming black paintwork. On a small car like this it's important to check for any parking dings on the bumpers or doors, but this Swift looks very tidy. Similarly have a good look at the alloys. With relatively big wheels for a small car, it's all too easy to kerb them. The interior looks especially good with nice clean seats complete with the sporty red inserts, plus pretty much no wear on the gear lever or steering wheel. Like we always say though, you can never truly judge a car from the pics - so it's always best to have a thorough inspection if you're going to view any car. While this generation of the Swift may not have had the most sophisticated cabin design, it has proved hard wearing and the layout still looks good for a car that was first launched in 2005. The same can't be said for that many small cars. Running costs should be reasonable with Real MPG figures showing you can expect around 37.5mpg in every day driving. Emissions are on the high side so annual tax is £180 but on the plus side, servicing won't break the bank at a Suzuki dealership. The Swift has proved a very reliable small car with few faults reported and nothing major to worry about. The dash can squeak which is more of an annoyance than anything else plus be aware that the Swift Sport comes on 195/45 R17 tyres, which is an unusual size in the UK and makes them both difficult to find and expensive. They're best changed for 205/45 R17 tyres that don't change the rolling circumference enough to worry about and are much more common and cheaper. So for £5000 you're getting a reliable and robust little sporty hatchback. We wouldn't go as far to call it a hot hatch, but if you're after something fun, affordable and well built, the Swift Sport could be right up your street.